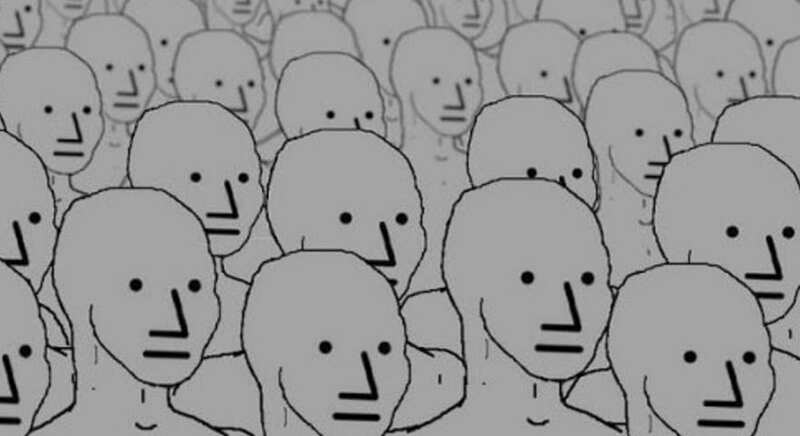 The Brief: NPC, which stands for "non playable character," is a meme used to criticize people, usually liberals, for being robot-like sheep and blindly following leaders. The term NPC originated in video games, referring to non-playable characters who are controlled by computer code rather than an actual person. The NPC meme started on 4Chan as a way to mock people for uncritically following a movement or political platform. Calling someone an NPC is a way to discredit their opinions, suggesting that they robotically follow someone else’s agenda without any passion or unique individual thought. The meme has moved from 4Chan and Reddit to Twitter, where it is mostly used to criticize liberals. NPC Wojak is the cartoon depiction of an NPC. He is a crudely-drawn grey-skinned figure. Meme-makers and trolls have edited pictures of liberal protestors, journalists, and politicians to have NPC Wojak faces. According to the meme, the quintessential NPC is a white progressive activist whose follows a liberal agenda without putting any thought into their actions or opinions. The pro-Trump and Alt-Right trolls who are best-known for perpetuating this meme portray NPC’s as easily-triggered SJWs who only participate in groupthink. They are programmed to make statements like “orange man bad” without ever considering the meaning behind them. One Alt-Right YouTube video called NPC’s “vacant flesh vessels to be used as an army for people like George Soros.” The NPC meme is not inherently harmful or hateful. However, its co-option by the Alt-Right has led to the proliferation of versions of the meme that seek to promote its white supremacist nationalist agenda. According to The New York Times, Twitter deleted around 1,500 NPC-themed accounts made by trolls. These accounts, which typically featured NPC Wojak avatars, mocked the stereotype of the liberal NPC. After “intentionally misleading election-related content,” through methods such as telling people to vote on November 7th. To many, the NPC meme is a fun joke used to make fun of people you disagree with. To others, it is a trolling tactic that can embarrass and distract people with opposing political views. The meaning of symbols can change rapidly, especially online. With the role that it is playing in Alt-Right meme branding, the NPC Meme may become an Alt-Right symbol as Pepe did, or it may disappear into the fog of seemingly infinite memes.